Coast 2 Coast Mixtape Promotions and Def Squad Present Erick Sermon’s Latest Mixtape, Entitled “Breath of Fresh Air,” Available for Free Download From Coast 2 Coast Mixtapes. 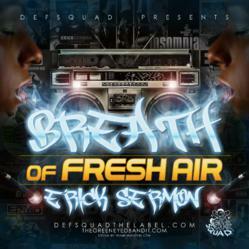 Hip hop artist Erick Sermon recently released his mixtape “Breath of Fresh Air.” Coast 2 Coast Mixtapes and Def Squad present the project, which is now available for free download. “Breath of Fresh Air” features Erick Sermon on tracks with Jamie Foxx, Sheek Louch, 50 Cent, Keith Murray, Too $hort, Lloyd, KRS One, Redman, Method Man, Fred Da Godson, Swizz Beatz, Rick Ross, and more. Erick Sermon is one of the founders of EPMD. He is also known for his production work for some of the biggest names in the industry: Diddy, 50 Cent, Lil Wayne, Akon, Jay-Z, Kanye West, LL Cool J, Mary J Blige, Mos Def, Redman, Method Man, Keith Murray, KRS-One, Ja Rule, Craig Mack, Heavy D, Das EFX, and many more. Along with Keith Murray and Redman, he also created the Def Squad. Erick has been called a hip hop pioneer by many. His hits like “You Got To Chill,” “Strictly Business,” and “Crossover” showcased some of the genre’s earliest commercial success and quality music videos. With partner Parrish Smith, he helped to cement New York as the mecca of rap in the late 1980s, subsequently spawning a number of other unforgettable artists such as Keith Murray and Redman. When his own career began to slow and, to the dismay of fans, he and Smith disbanded EPMD, Sermon found a long, success-filled career producing music for countless R&B and rap acts. He was one of the early MCs to extend his brand beyond the booth—a wise move at a time when label deals were shaky and corporate America was still being sold on the commercial viability of rap. Sermon never stopped rapping and performing, releasing critical achievements like the Marvin Gaye-inspired “Just Like Music” in 2001 off the J Records release, Music. Strictly Business was an album that laid the foundation for modern hip hop, sampling everything from Eric Clapton and Pink Floyd, to Zapp and Steve Miller. In the two decades since, Erick has established himself as one of the genre’s greatest producers, with over 70 million album sales. Erick produced 14 albums under Erick Sermon, EPMD and Def Squad and his filmography includes over 30 movies and documentaries.